Kindness resides in all of us. 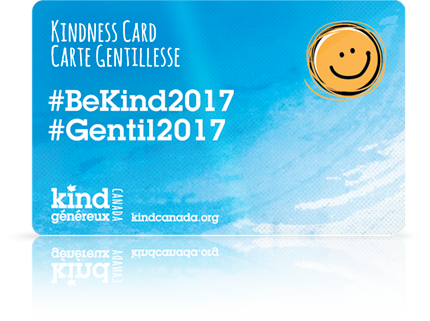 Our purpose is to increase awareness about this natural human interaction and help create the conditions for the practice of kindness to flourish in the Canadian school environment. Our philosophy is to focus on character strengths, healthy relationships and positive engagement in order to improve academic and human achievement. 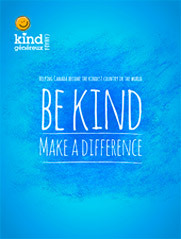 Kind Canada’s vision is to develop a national Canadian kindness curriculum for students in elementary and high school. The programming would blend evidence-based learning from research of the science and health benefits of kindness with best practices in learning and teaching. Improved well-being and mental health. Increased ability for students to reach their full learning potential. Reduced achievement gaps to attain academic success. Reduced risk behaviours, harassment and violent behaviour. This approach will nurture behaviour and shift the culture of the school environment through purposefully including kindness in everyday interactions.